"Suzuki Saemon Hida no kami Shigeyuki is a marksman who attempts unsuccessfully to shoot Oda Nobunaga (1534-82) during an ambush at Ishiyama. this scene is compared with Lingering snow at Ishiyama from the Eight views." Quoted from: Heroes and Ghosts: Japanese Prints by Kuniyoshi 1797-1861 by Robert Schaap, p. 108. This is illustrated, too. 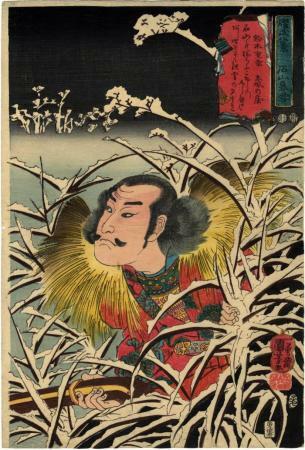 Also illustrated in Kuniyoshi The Warrior-prints by Basil Robinson, Oxford, 1982, S76, #2.